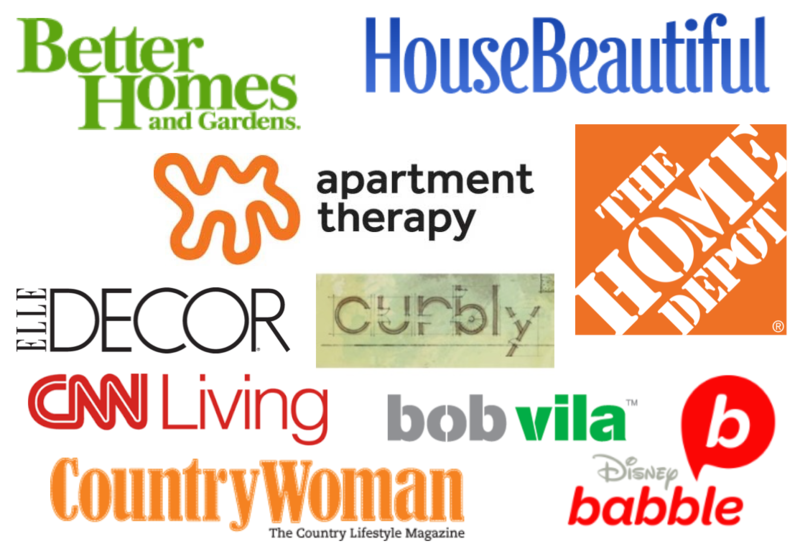 If you didn’t have a chance to check out the blog sale this weekend, stop by – there are still some items left! 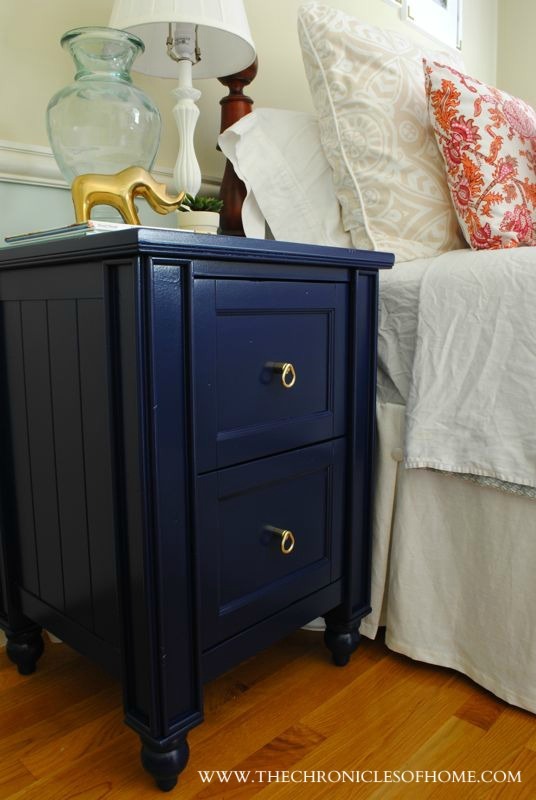 Now on to that navy blue nightstand. 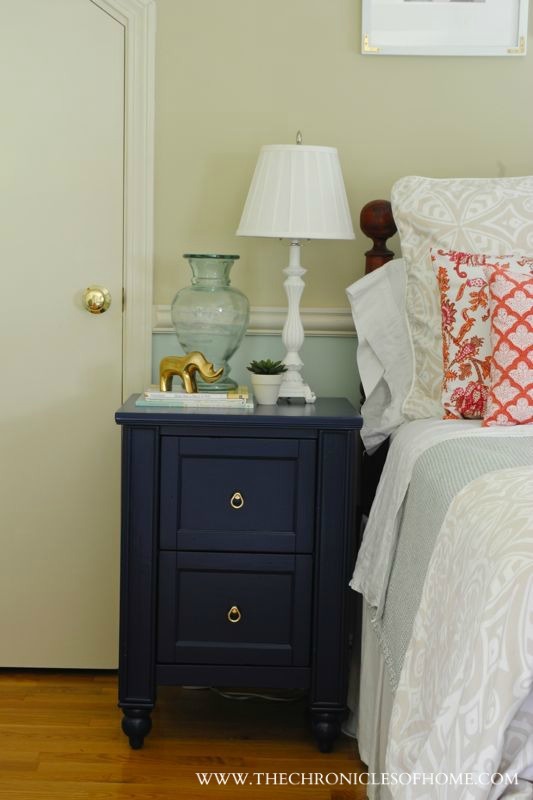 You might remember a few weeks ago I shared an inspiration photo of a coral and navy blue little girl’s bedroom. 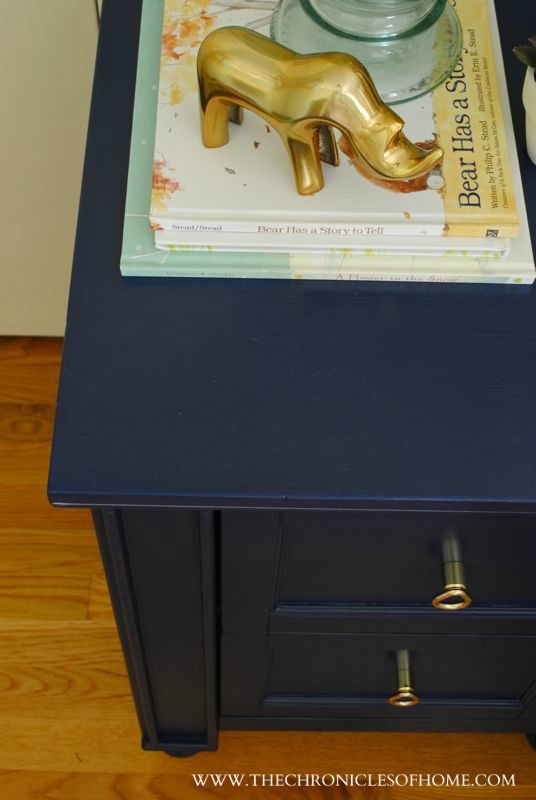 I decided to incorporate the color palette into Ellie’s room by painting her nightstand navy blue and her dresser coral. The nightstand, however, tuned out exactly as I pictured. Navy blue can be tricky but this was just the color I was hoping for – a brighter navy that didn’t come off looking royal blue but wasn’t so dark that it looked black. 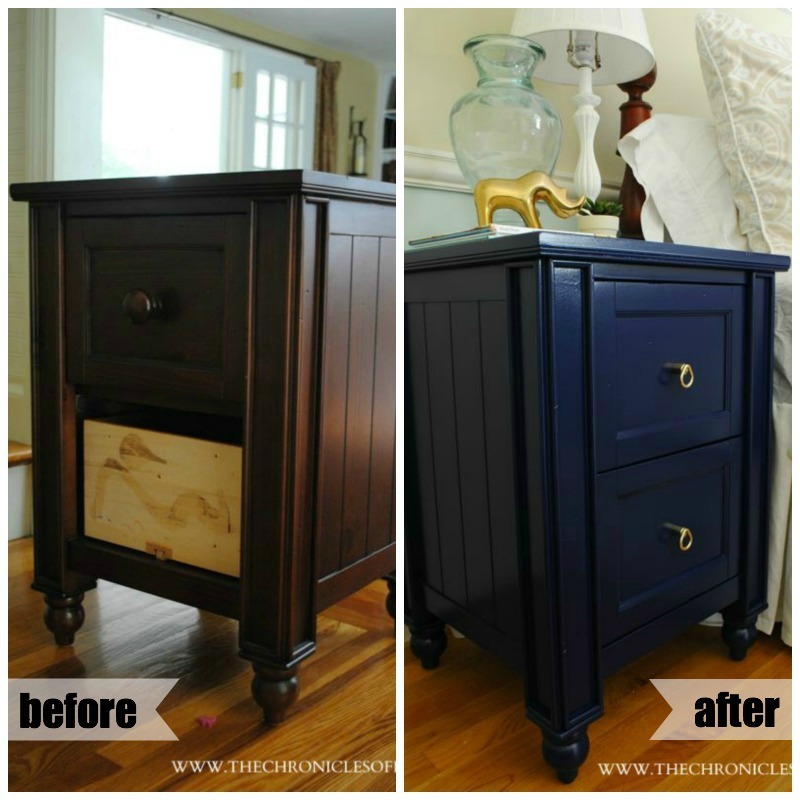 I used Symphony Blue by Benjamin Moore in a semi-gloss finish. I’ll warn you, though, it looked a little bright outside in the direct sun. Once I got it into Ellie’s room it was perfect. As for the process, I used my new paint sprayer, which HomeRight sent me to try out a few weeks ago and, let me tell you, I L.O.V.E. it. It’s the Fine Finish HVLP Sprayer and I have used it almost every day for the past week. I’m bordering on obsession with it. 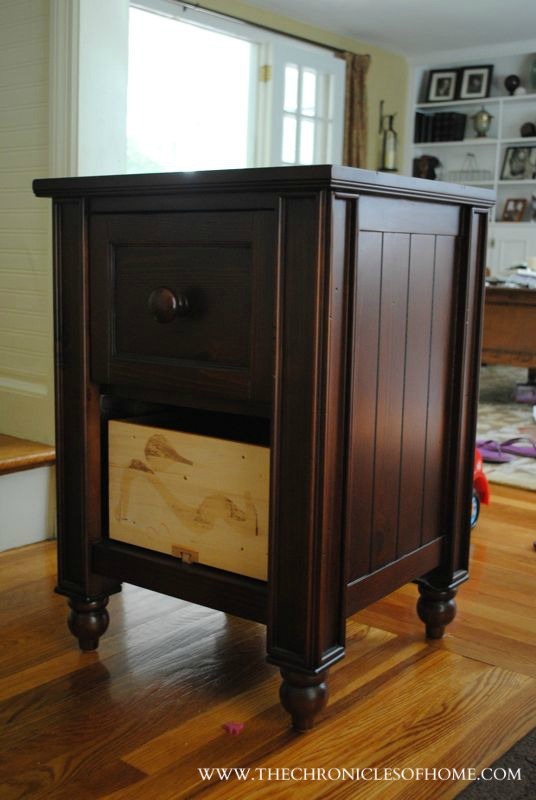 It’s actually a really nice piece of furniture I bought a few years ago from Pottery Barn Kids, but Ellie’s room just had too much brown in it, so this little nightstand got in line for a makeover. 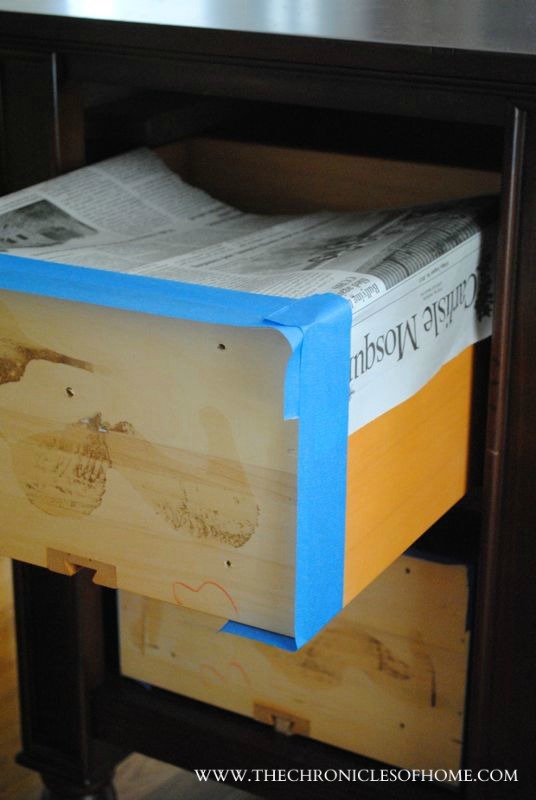 I removed the knobs and drawer fronts (both came off easily inside the drawers with screws), then used painter’s tape and newspaper to cover the insides of the drawers. Then I used the paint sprayer to coat every surface that would be getting blue paint with primer. You do need to thin the paint with some water before using it in the sprayer, and I found the primer needed much less water than the paint. The sprayer comes with a “viscosity cup” to help you determine the right thickness. This is important because too thin will cause lots of drips and too thick will cause the paint to splutter and not go on smooth. And the smooth, factory finish is what this sprayer is all about! After the primer dried for an hour, I added my first coat of blue paint. I wound up applying four coats of the blue, which I know sounds like a lot, but I did very thin coats so there wouldn’t be any drips and the coats dried extremely quickly. After the last coat of blue was dry, I covered the whole piece with Minwax Water-Based Poly Acrylic. This protects the paint and also gets rid of that tacky feeling latex paint has, no matter how long you let it cure. 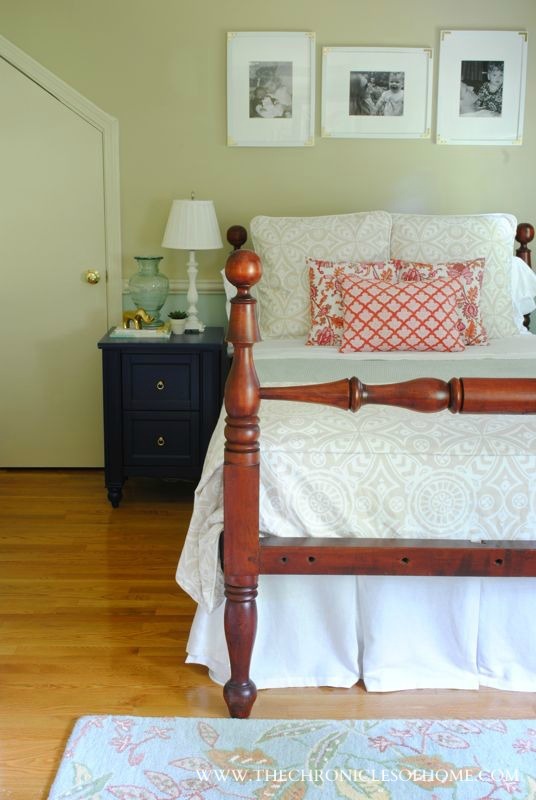 This is especially important for a shelf or piece of furniture that will have objects sitting on it. I let the polyacrylic cure for a few days before putting Ellie’s nightstand objects on top, just to be sure I didn’t damage the paint. 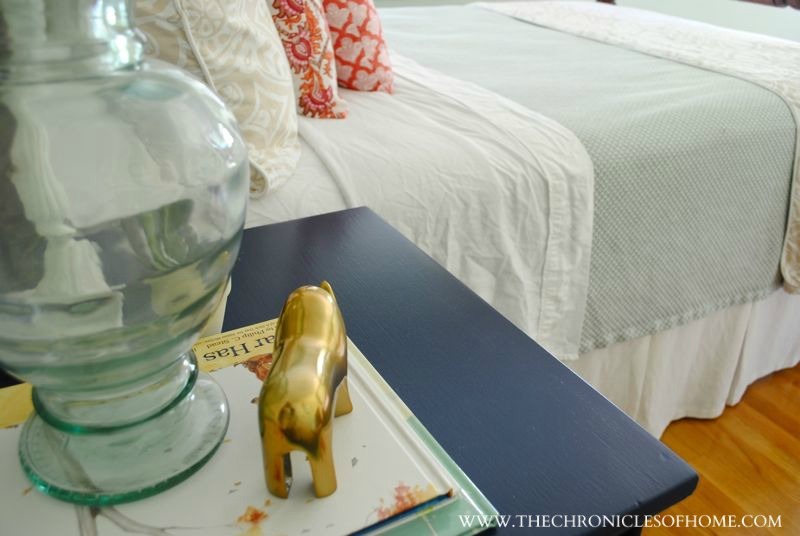 Ready to see the “new” nightstand? Notice that pretty new hardware? I got the solid brass teardrop pulls from D. Lawless Hardware, which is always my first stop when I’m looking for some new bling for a furniture piece around my house. I also switched up the wall hangings above Ellie’s bed and framed three photos using inexpensive frames from Target and gold corner braces I got at Lowe’s. 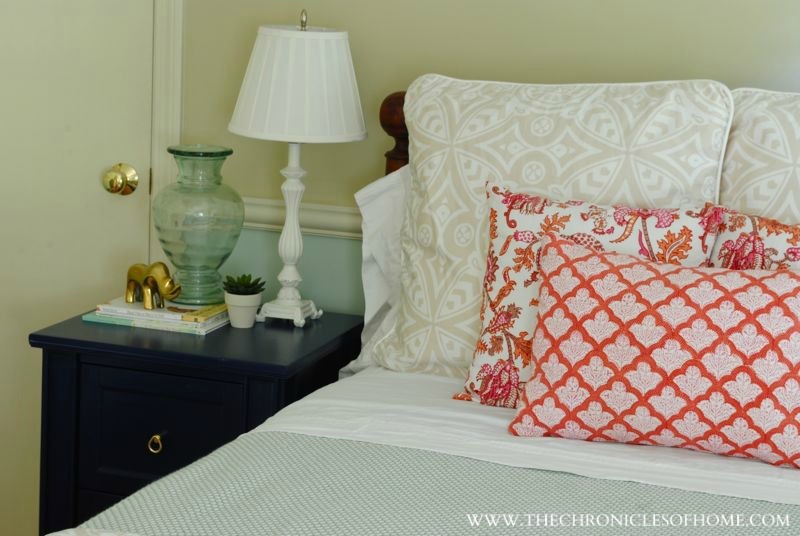 I am loving the way the navy adds a dark note to the coral and aqua that were in the room already. 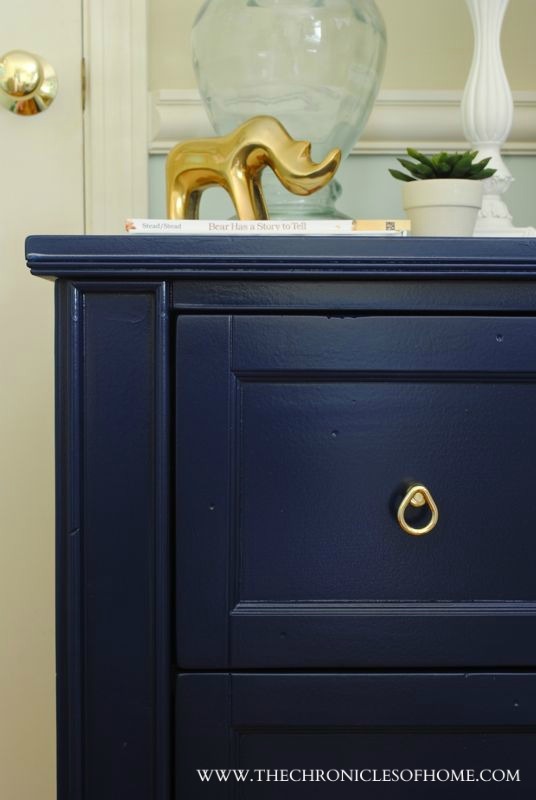 This is the first piece of furniture I’ve painted navy blue and I’m so in love with how this little nightstand turned out, I’m finding myself daydreaming about painting other things navy blue now. With the paint sprayer, of course. Because I just can’t get enough of the thing! How about a few more looks at that new navy blue beauty? Stay tuned this week and next for other changes I’ve been making in Ellie’s room, including a small gallery wall and her coral dresser. 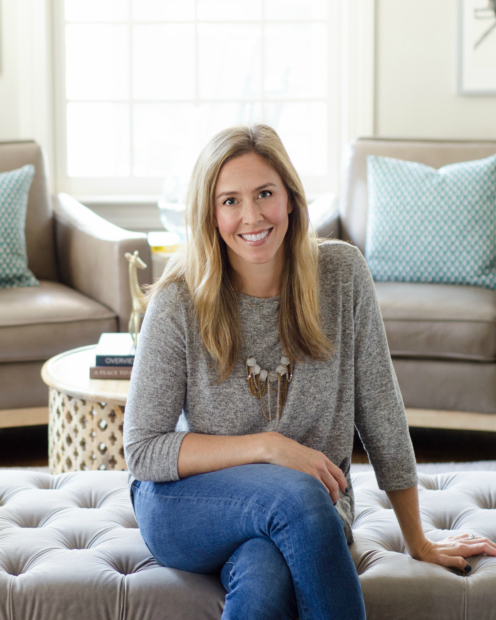 I can’t wait to share the whole finished room with you soon! p.s. There’s still time to enter the giveaway for the Color-Glide Pro 4-pack!